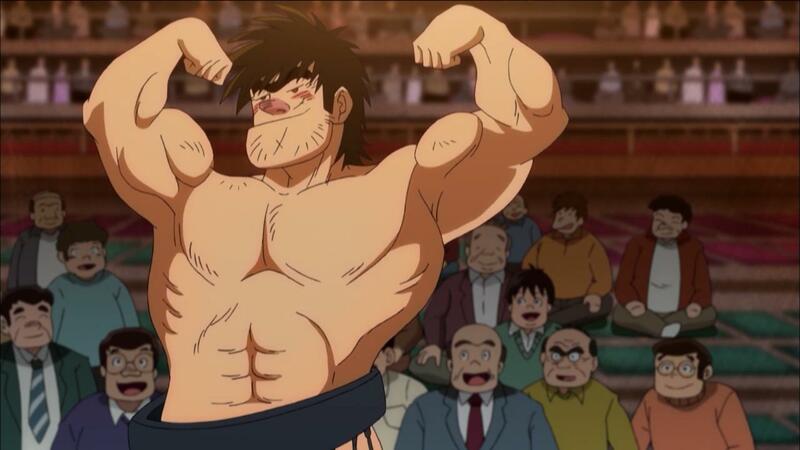 My second set of episodic notes, reactions, and commentary from Rowdy Sumo Wrestler Matsutaro!! (Abarenbou Kishi!! 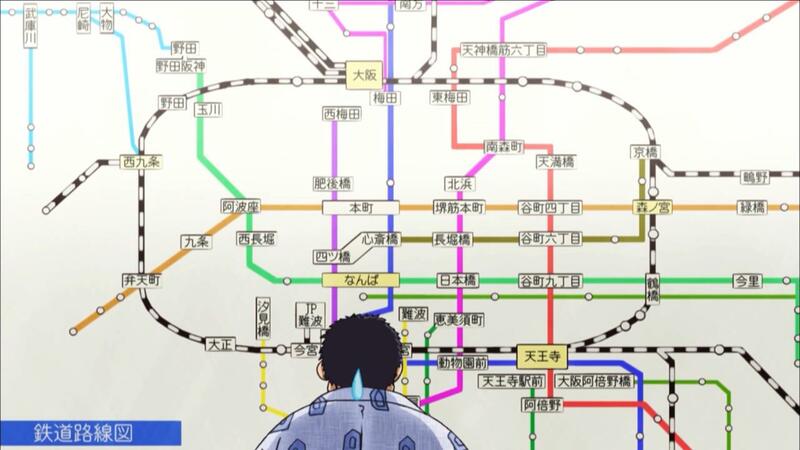 Matsutarou), which aired during the Spring and Summer 2014 anime seasons. Looking part one, for my comments relating to episodes 1 – 11? Click here! …is this where the show has settled into its stride? I do not mean that sarcastically either. If one takes the Tanaka episode that may as well been a Spring season finale, the near aversion of match fixing last week, and this, we have settled into a nice little rhythm here. Sure, even as a slice of life character series I can not say I get into it on the same level as numerous others, but I do not really mind the show either. It airs, I watch it, and I do not really feel too bad about it. Which I feel it had some struggles with in the past Spring, as some weeks were definitely wildly different in tone or compatibility with me than others. 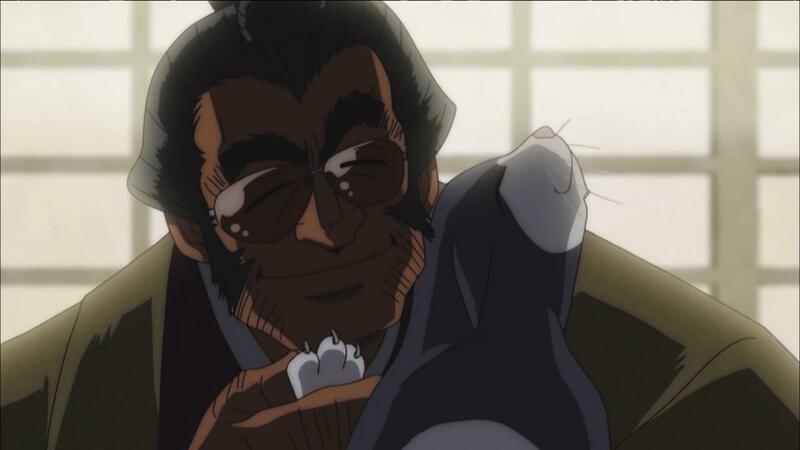 This episode was Matsutaro sitting in the backyard giving voice narration to cats on a fence as if they were dates he was having. Another cat comes along and chases them away, so he has arguments and confrontations with said cat, who is actually a stray being fed by Inokawa because he considers it a good luck charm. Matsutaro causes enough problems where the cat and Inokawa are then no longer in the same place at the same time. So the elder wrestler puts up a reward, going back to the prize money and reward issue from the previous episode. Matsutaro wants reward, but shenanigans ensue and he fails at that but the cat is back safe and sound. And you know, that is fine, you see. Even reading the plot on here condensed like as is. Nothing really wrong with the story as executed, a pretty classic amount of jerkiness from the leading man, and works as pretty much the definition of a standard weekend cartoon show episode. It is a far cry from the material that tended to chase a lot of folks out during those very first few episodes months ago, at any rate, even if it is pretty simple stuff that is rather hard to screw up. Which is such an odd timing for such an episode title, in the sense that most of us tend to think of this time of year indicating being in full swing of a brand new anime season. But, this is one of those more “evergreen” shows that sort of operates independently of all that, going along with Mike Toole’s recent ANN article that features the series extensively. Still, given that there was a two week production break not all that long ago, one would have imagined an episode like this that comes down to a title and promotional bout would have been the last one prior to that. But, either way, here we are. And it is time for wrestling like we have never wrestled before. Which I suppose is as good a time as any to consider Sakaguchi did enter the sumo world at makushita level, the third highest of the six ranked sumo divisions. I had never actually paid much attention to where they actually placed him, before. It probably slipped by me entirely, as I feel this is something that had to have come up as at least an offhanded remark earlier, and I was terrible at actually noticing his style of dress was indicative of it. It is actually a really solid place to have put him, in a story framework like this, now that I am thinking about it though. This is the thoroughfare, where folks with promising careers yo-yo back and forth with both each other and more established individuals recovering from setbacks. Hit the jūryō level, and one gets to be sekitori like Inokawa. Which is to say, the top seventy wrestlers between the top two divisions (jūryō and makuuchi), and in turn those who come to be served rather than those who serve. Naturally, a big prize for someone like Sakaguchi, though for perhaps the wrong reasons. That Kondo had the consideration he would meet our leading lad again in future fights I feel is also a good nod towards this entire system. While he is by all means incensed by Sakaguchi’s unbecoming behavior, he does not want to use trickier tactics against him as it would in turn come to set a tone for the bouts that may come later. And it is a good fight, a clean fight with just a hint of a Looney Tunes chase it in and a reasonable level of Sakaguchi’s strength coming into play. One can not really ask for more than that, really, especially when it comes to where our lead will go from here. There was a whole lot of “This is hell” quotes dropping out of characters mouths this week in respect to out leading man, and yet it at the same time took us back into its more lighthearted mode. Sakaguchi wants himself a victory parade after last week and all, and folks need to take his mind off of the entire idea by whatever means necessary. And those means happen to in this case involve dragging Reiko back into the show and essentially railroading her through a sort of day out or afternoon date series of misadventures. I can certainly imagine I may get future mileage out of screencaps for the headache patches used by our sumo stable master and his wife. That, or maybe their “I’m not playing dead, I’m fainting” commentary at the sight of the large angry man who wants his convertible ride and confetti celebration. What has been interesting to me is that Reiko has been so far removed from so much of the events of the show, despite in many respects being a genesis for Sakaguchi’s wildest night at the start of the series and running off to Tokyo to be closer to her far more than being a sumo wrestler. I do not expect her to have much of a compelling romance or even of a relationship to our lead, so the focus here being on the volume of the locations they go to is noteworthy. Temple, a city park, the amusement park, and so on. The structure is one that is playing more to the frantic or furrowed “Please for the love of all that is good, forget about having a parade” worry over a more interpersonal human connection. I mean we have our champion sumo wrestler now chasing pigeons in public because he wants to shave them with hair clippers so they can be roasted. We can not take him to the zoo, because he would want to shave them too. 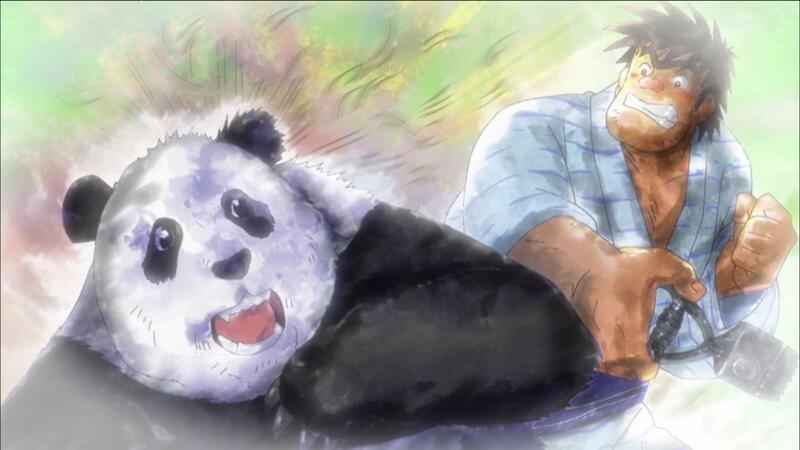 Never mix up “shave the pandas” with “save the pandas” unless you are in the right company, incidentally. Because of the nature of this show, that the mission to make Sakaguchi forget about having a parade fails is not only not a surprise but the expected natural way of things. He just gets a slightly more refined version of what he wanted. And if the large sumo man now wants to pedal around town in a little panda car over the original convertible dream, well, who am I but to encourage his continued behavior. The “You Can’t Go Home Again” episode, essentially. Which is true, in the sense that if one has actually progressed or gone anywhere in life, then there is going to be those massive disconnects one picks up on between what things are now and how they used to be (or how they perceived them to be). Not always for the worse, mind you. So our big guy is coming home for a bit via regional rail, and the Matsutaro family come to get him at the main station. Which is nice of them as a gesture in itself because of how much that would cost even just as bus fare. You are looking at the cost of mom plus almost half a dozen small children, from a family that does not have a whole lot of income. Sakaguchi, because he is less of a complete monster now than where he started in the show, does treat them for parfaits and other delights with money he has earned and saved from what he has accomplished so far. Which includes hiring two taxi cabs to ride back home to town in, over the bus. Mom gets to sit, be more comfortable, get the kids out of her hair for a bit, and so on, while also handing over to her the big wad of bills he has saved up for them after all this time. Standard “Guy used to be a big jerk, but he is looking out for his family though he does not really want to show it” stuff, but it works well enough given the journey this has all been. Plus, in all this we get to see more of Sakaguchi in that fabulous dragon tie of his, with a new purple suit to match. One wants to look fresh for the occasion. Even after arriving, the next day he still puts on a nice shirt and all, which is even better for putting fools in their place. Otherwise though, yeah, while many of the episodes do play out generally as expected much of this does go exactly as one would think would happen when a guy like Sakaguchi comes home. He is much bigger than before, for one thing, given the sumo regimen. Even the general framing of the episode uses a lot of low angles during many of his scenes to emphasize his general girth. The house, town, and so on do not quite feel the same, having been living it up in Tokyo as he has been. Things like him observing his mom at the little household shrine to his father, or noticing the scrapbook full of newspaper clippings of his achievements. He crashes the school day, and while on the one hand he gets to show off things like the ritual shiko exercise, things like him participating in classroom cafeteria affairs does not quite feel the same anymore. He walks around old dogs down, rather than kicking them out of the way, or threatening to splash the older women of the town with buckets of water as he used to, but he can not bring himself to do so. And it is frustrating, in a sense, to him. As it does mean things are different now. And he wants to leave without saying goodbye. Which also goes as one would think (which is to say, those townswomen noticing and set up something for him, and he manages to actually bring himself to have some parting remarks, in his own way). I still have no idea how long this series is actually supposed to go on for, as there are still two whole sumo divisions for him to conquer. But, ideally this episode means he as a character reflected on how different his life has become, and thus burning through the next level faster. We would like to see him in the top division sooner rather than later, after all. It helps as well that this was one of the best looking episodes of the entire series, playing with lots of soft lighting effects and the general camera work going on. It more than shows the team working on the show have the resources within what I am sure is pretty tight purse-strings to step things up when they want / need to, which speaks well for the program on the whole. We still do not have an end episode count for a show, near as I can find, and I have no clue how well this series is doing in the ratings. But I imagine even its (I’m assuming to be) limited budget would have gotten slashed down had it not been meeting or exceeding expectations. The series was on a hiatus last week, and the episode shown prior to that was one of its more tonally serious or heartfelt affairs. Matsutaro coming home after a successful sumo season of growth and advancement, and realizing how much he feels out of place now in the location he used to dominate with his size and aggression. Now he is bigger than ever, and yet a degree kinder as well, as he also is coming to terms with his ability to better financially support his impoverished rural family. It was also one of nicest looking episodes of the series so far to boot! Perhaps naturally, this episode then was a cause to take up some lighter events: summer touring across the country in the off season, and the associated slapstick one can engage in with train rides. And an oaf of a guy who despite degrees of personal progress here and there really does not necessarily understand public decency on the whole when left to his own devices. Particularly in a confined space like public transportation. It is kind of a disappointment, in a sense, as those stronger serious episodes which have made up a reasonable amount of the output in recent weeks have been enjoyable for a series that I was not necessarily as sold on in its earlier stages. They have a solid arc to them, as a collection of character development sketches. Now, as a longer running and more mainstream entertainment series that still lacks a scheduled end episode count, I understand the need for filler weeks where not a whole lot actually happens or could in some respects even be seen to be a reversion of previous progress. Certainly, the Matsutaro of the last episode and the one this week do not really gel as being the same person days apart from one another, even with the locational shifts and potential resulting changes in behavior based on surroundings. Even filler can be sort of fun though, but here I am sort of lacking for much to actually say. This was an episode about suitcase packing, how much underwear should one bring on long sports team trips, train car seating and dining shenanigans, with resulting indigestion and bodily function problems. The episode just sort of washed over me, much like how Matsutaro whooshes in to steal and eat the snacks from luggage that is not his own. Before one knows it, it is gone. This episode was delayed due to the Obon holiday, which makes sense (though the exact timing varies by location): it is a festival time and one of honoring one’s ancestors at that, and given the intended audience for this series runs a lot older than most other anime taking time off is logical. Though interestingly enough, the series did not take the complete week off, and instead popped this episode out in the middle of the week instead. 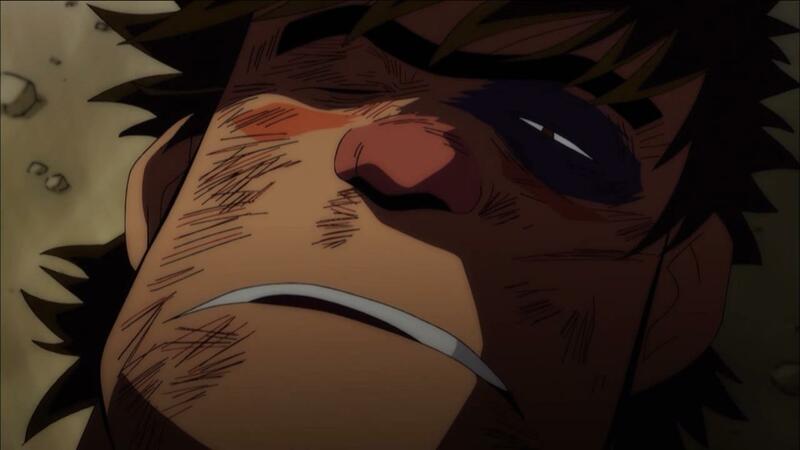 And episode eighteen will still come out this weekend as it normally would. I have been raking through my mental cobwebs, and I can not recall this sort of thing happening with any other series I have blogged about so far. Not to say it has never happened before at all in anime (I would be shocked if this was the first time, really), though it is certainly an odd set of circumstances to me. I suppose, as the show did take those two weeks off around early summer when the World Cup was going on, they still want to maintain some semblance of keeping up with their actual internal schedule. Though we still lack an actual end episode projection count as of this writing. Anyway, let us stare at the episode we do have. This episode is entitled Osaka Rampage. Our motley crew of sumo wrestlers are lodging in a temple. Not only do they have the natural force of nature that is Matsutaro in tow, but the temple is also next to a cemetery and the characters remark on how Tanaka get become terribly powerful and frightening when properly spooked. As far as Rowdy Sumo Wrestler Matsutaro!! plots go, the writing for this is all over the walls. Which is to say, before the episode is over, some of those are likely to be coming down. And one would be half right, because it turns out it is mostly temple doors which bear the brunt of the facility destruction by the end. That aside, for what is another more slapsticky filler style episode over any character advancement (which I imagine this entire sumo tour may well turn out to be), there are some reasonable moments. Our lead, who just in the previous episode was stealing wholesale quantities of food from the luggage car on the train, catches Nishio here trying to take a candybar offering from a gravestone after a curt little prayer. And he puts a stop to it, gruffly responding that the old man would be cursed for doing such a thing. So that is by all means a contrast to what our leading man was up to last time, and that he actually does have (been it recently acquired or not) a line when it comes to this sort of sneak stealing behaviour. 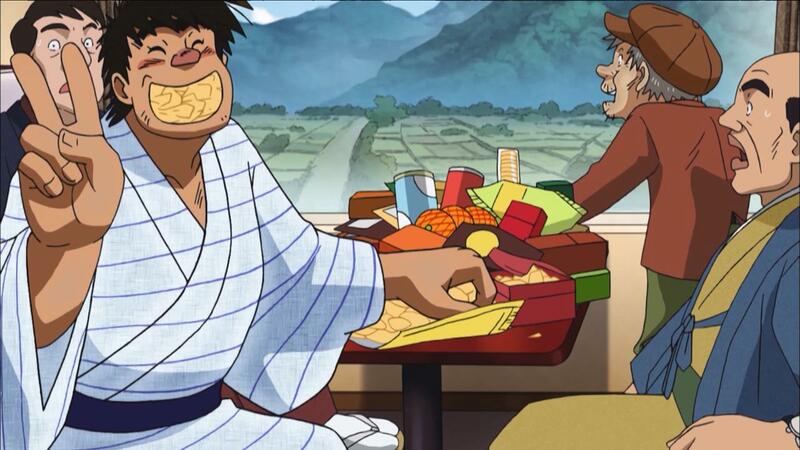 On the subject of snacks, much of the rest of this episode does involve Matsutaro and Tanaka eating out, which is by all means something the city in question is famous for being able to provide in ample quantity. The most lengthy of all the bits in this sequence of eating down the lane comes to involve a significant argument over the cultural values of double dipping one’s food in communal sauce ment for skewered fried pork. Well, it is as significant a clash as anything else in this show, at any rate. Matsutaro’s course of action, naturally, involving triple and then quadruple dipping, by way of multiple wrongs must in turn make a right logic. Tanaka’s solution to this situation however, as the establishment in question issues fines for double dipping, is to merely chug the entire container. Thus, since it would need to be washed anyway when depleted and there is really no theoretical limit when it comes to sauce consumption (just one of practicality), the day is arguably saved at the cost of severe potential future indigestion. Especially given that by the end of the episode, we do indeed have Tanaka go into full power compensation freakout mode when in the cemetery after they stayed out too late. May those aforementioned wooden doors rest in pieces. This is essentially Dad Jokes, if not Grandad Jokes, The Show, so that is fine enough for what it wants to do here. I will be interested if the show has anything up its sleeve for this weekend, since it did not want to set anything back any further. Between last episode and this, a significant chunk of the senior level cast went to Hawaii on their touring season. 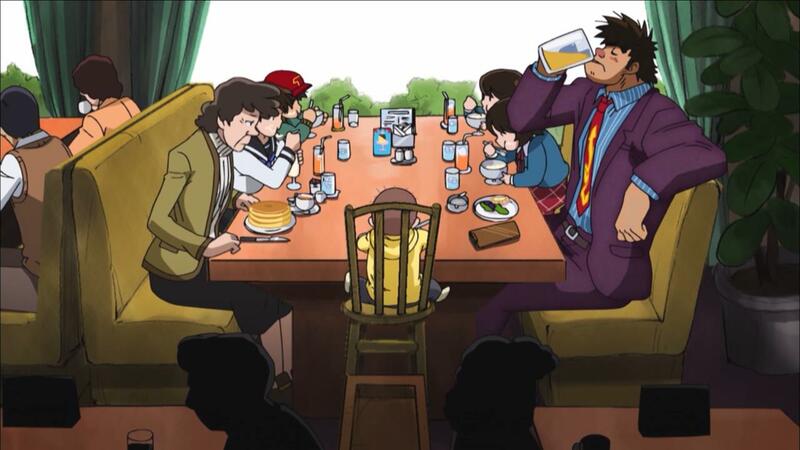 Naturally, this did not include Matsutaro. He is kind of peeved about it. Which is understandable, to be honest. I mean, I would want to see what a runaway freight train like him would get up to while on a resort vacation. We get some fantasy bit sequences, sure, but that is not quite the same. This is one of if not the silliest of the more “filler” type episodes in some time. Tanaka smacks his head too hard during training and gain psychic and precognition powers. Our leading man makes a direct cutaway fourth wall break to any sumo fans in the audience about if his goal to hit Yokozuna rank within a year seems too fast. Misunderstandings and one faux pas after another ensue during simple grocery shopping trips gone horribly wrong. Meanwhile, Tanaka’s own mental extrapolations on the situations at hand are all in a very super deformed limited animation style, mixed into flashbacks from his childhood relating to neighbors dressed up as demons. It was just a downpour of gags, complete with Matsutaro getting hit on the head in the exact same way to the exact same reaction via different situational objects at hand. Really, the only thing holding it together is sheer momentum and commitment to the task at hand. The comedic style of the series, as mentioned before, does historically tend to sit around a very particular Dad / Granddad Jokes level of corniness. So for it to veer off into psychic powers and such for a time is way out of left field, even if the series has been rather elastic in the realism department. But, it does thoroughly commit to the effort, from Tanaka crossing wires with Matsutaro’s thoughts and getting offended how to it is envisioned of all the ways Matsutaro will wreck a situation unless Tanaka intervenes. Which does, of course, cause its own issues down the line. All in the name of a framing device where Tanaka needs to learn to make more robust chankonabe for an eventual post-sumo retirement restaurant career option. It is by every measure the most wildly elaborate of these off season touring episodes compared to the train and Osaka eating episodes, so ideally this means the regular sumo season will be back in session soon. Better to end this “arc” on a note like this, I figure, as otherwise another would seem wasteful unless it pushed the levers even further. At which point, the entire operation would likely break down. We return more formally to the Raijin stable proper. Or as “proper” as this show ever gets, I suppose, compared to the psychic adventures of our last outing. Then again, this is an episode about a wedding. The one of the daughter to a primary funder of the entire sumo stable, at that! But, it is still this show, after all. Nobody is getting out alive from any of this without breaking a few eggs. Or cakes, as it were. Although in this particular case, the bride is in on the shenanigans and actually is seeking as many of them as possible to muck up the entire day so that she does not have to marry someone she does not actually have any feelings for in that department. As a character bit, this is a good day out for the series to take. Matsutaro is effectively helping out and doing a good deed, even if his reasons may be for the idea of being able to somehow obtain a personal reward. As general viewers, most people reading this would probably be sympathetic to someone trying to break out of an arranged marriage they do not want to be in. So tonally, Matsutaro’s ensuing rampage and shenanigans take on an entirely different tone than where this episode was suggesting more towards the start. That is, that he was supposed attend the wedding to pound mochi, while he then pursonally planned to make a much larger scene. The destruction here is “positive,” in a social sense, since the wedding does not go off. This is unlike a lot of the other breakouts and dustups of activity elsewhere in the series, and this a good place to see it come into play. Nowhere near too soon after his massive jerkface beginning, a successful sumo season already elapsed and the developments that came of it, and another one readying to start. In a way, it is quite appropriate here for the series to pull the nearly two minute recap card of just the last episode. It was, in the end, a sabotaged wedding for the good of the bride’s freedom of an arranged marriage as well as providing an outlet for Matsutaro and his associates to shake things up to their hearts content. You can not exactly ruin the bride’s wedding when she does not even want to be in the situation to begin with and has provided carte blanche to for them to crash the ceremony, after all. That episode is classical comedic because it deals in unexpected scenarios befalling what is usually supposed to be a more formal event. But sometimes, you know, people do actually want to get married because they like their partner! And someone who may like another may not have their feelings actually reciprocated at all. And so here with are with the “Matsutaro Confesses” episode of the series, attempting to make good on a plot point that has always sort of hung around the show but it never really wanted to deal in too terribly much on the more dramatic end of the spectrum. Matsutaro fancies Reiko, but she has been encouraging him to do well because she wants him to succeed as a person, not because she secretly wants to date him or the like. For that matter, Tanaka has thought Reiko is pretty cute as well, since he first made her acquaintance, which has allowed for some minor back and forth lines between the two wrestlers here and there over the weeks. So through what has already been a long series of misunderstandings and fantasy sequences already, we get one more on the larger episode scale. Reiko inviting them out for dinner, each of them taking it way too seriously from fantasy boating sequences to showing up with a ludicrously large bouquet of flowers (especially when accounting for sumo size). We have the antics of who gets to sit where at the table, the standing of ground and the frustrations when one does not get their way, while at the same time each attempting to put on a semblance of their best face. And it is all, still here, a giant misunderstanding. Reiko has invited them out as friends, not for anything more than that. She already has someone she happens to have gone through marriage meeting matchmakings with, and most importantly, actually likes the prospect of being in a relationship with. There is this mix of a kind of progressive move while also retaining a traditional bent. It makes sense neither of the guys would have considered the possibility, given their mental states and some goings on in the larger background (such as a general decline of but by no means extinguished custom of matchmaking meeting practices). Let us be honest, even in most media taking place in a modern setting the basic scenario of a young woman asking out a professional athlete guy to dinner could still be taken to similar levels of crazed misunderstanding for plot purposes, and yet this show is taking place in the 1970’s. We are effectively out of the post-World War II reconstruction years which stabilized and bloomed to great effect during the 1960’s and right on the cusp of the Japanese Economic Miracle of the 1980’s. There are a lot of changes happening in the midst of all of this from a social standpoint. While the series does not really directly deal in them so as to continue generally being a more comedic show I feel these are important matters in keep in mind at least on a surface level, especially for anyone who managed to make it this far in the series so far. Even so, while this was certainly one of the more dramatic leaning episodes by the end, Matsutaro does get to make a big mess. It just happens to be the one created on the big guy’s face when they realize the feelings of another are not something they can brute force they way into. As of last week I still could not pin down a projected end date for this series, but in the time since things have finally locked down on that front it seems: twenty three episodes will be its run here, be there another later season down the line afterward or not. We pick up where we left off then, with Matsutaro coming to learn Reiko supported him as a student and former student but not as a love interest. As well as the crushing sadness which hit him upon this revelation, and how he has continued to be in such a state for a week straight now. So, this is almost real time, in a sense! Anyway, the situation as such is one that in the short term is found to be agreeable to the other wrestlers at the Raijin stable. Their most problematic member is effectively out of commision, which means the overall number of problems he has caused have dropped dramatically. This, of course, eventually leads into the understandable recognition that unless he snaps out of this funk, everything the team have put up with to get him to this point and the potentially great future he could have for them as a wrestler would effectively be thrown out the window. That all of the traditional loves of our lead (nice eel takeout orders, favorite idol magazines, etc) fail completely to dissuade him from his course of continuously crying under a pile of blankets is the perhaps expected route in a situation like this. That he escapes when nobody is looking to drown his sorrows somewhere else is also within the realm of what one would think would happen next. In this case however, after a series of misadventures of poor descriptions to pedestrians trying to track him down, he is found on top of a temple in a combination scene fit for both a a King Kong movie or a suicidal jump. Given the physics of this show he would likely turn out reasonably well in such a situation, but still. He needs to be brought down somehow. While not a traditionally amusing series of comedic adventures at this particular point, it does allow Tanaka to get a spotlight character scene again. 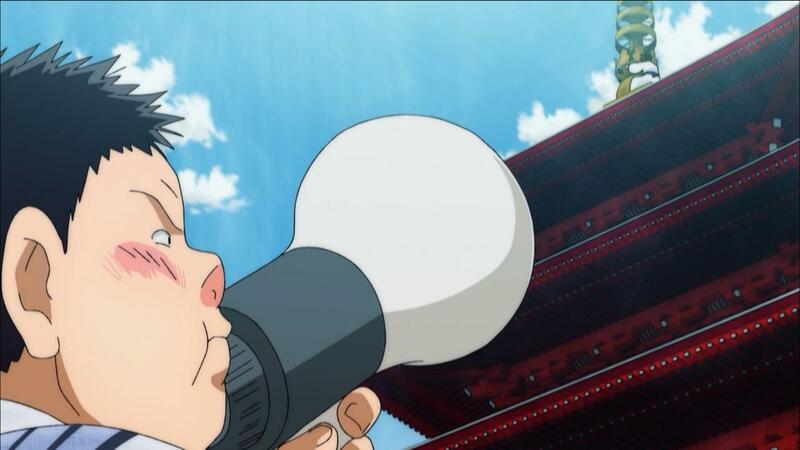 Where all other efforts fail resoundingly, Tanaka takes charge of the megaphone situation and proceeds to verbally reem Matsutaro out for several minutes. Bile, contempt, dismissal, anger, and so on. Things which have built up over his time with the man who cares for but a select few outside of himself, and opinions coming on after another on how much of a failure as a man Tanaka considers Matsutaro to be. That other characters take it as a reverse psycology move is perhaps understandable, but, I am pleased the show does the time to have Tanaka explicitly tell such others verbally that he really does mean every word he said. There is a lot of pent up aggression and frustration in that head of his after all these weeks. I am pleased when productions do not have the characters in similar Scream Them Down situations hedge things by saying they did not really mean what came out of their mouth (either officially, or saying that as a cover for their actual feelings to paper things over after the fact). Tanaka is unapologetically angry. It does not mean he wholesale hates Matsutaro though, and indeed even shares with him that he too fancied Reiko as well and thus was affected by her marriage meeting in his own way. Friends just sometimes need to yell at each other to get them on the right path again. And I feel that is an important little thing for a show like this to remember now and again, especially given everything Matsutaro drags everyone else into. I do not really think that has ever been much of the case. Just the other week he was hanging handing off the top of a temple he climbed atop as a reaction to his not being able to date Reiko, after all! But, there is also a question mark. Room to wiggle, and a man of Matsutaro’s wrestling size can definitely make use of that. This episode did, admittedly, confuse me regarding what our timeline has actually been. Episode thirteen of the show was of course named “The Season’s End,” which has his championship bout at the makushita level. But, characters mention in the two wrestling seasons since he has only won about four bouts per season. Which, to me, does not quite seem right, as everything since episode thirteen has been what I thought was a rather linear and closely related series of events like Matsutaro returning home for a spell, the several episodes spent on post-season touring, and so on. Which may well still the case. What seems to have happened is that, after the events of last week and Matsutaro going through his personal meltdown after Reiko’s rejection, we skipped two whole sumo seasons without much establishing information about having done so other than that one line about Matsutaro’s performance and a later dinner with the stable master. While watching two season’s of Matsutaro fail miserably (due to his still held personal hang-ups regarding Reiko and the effect her telling him “No” had on him) would probably not make for the best long term entertainment, this does still seem rather abrupt and jarring. We did not have a finale episode count for this series until last week or so, while others are established far longer out in advance, and a finale number of twenty three episodes is a bit on the smaller size for a series which stretches two seasons. I have to wonder if it has been doing the numbers TV Asahi and/or Toei Animation wanted, as this is certainly a series dependant more on commercial viewership than otaku merchandise and home video sales. Maybe this is as graceful a way they can manage to cut to the chase and attempt to end on a higher climatic note, maybe this odd time skip was planned for the start. Either way, in execution it does throw one for a bit of a loop given how much stable opinions of Matsutaro and his (now more mellowed) personality seem to have shifted. Kondo returns again, which ties in to his previous consideration that he would be meeting Matsutaro again in a future fight. This time, of course, it is with the background that Matsutaro had injured him on their last encounter and so he needed to be out of competitive competition during his recovery. And he is sure to let Matsutaro know it, and that this time he will be coming for him. 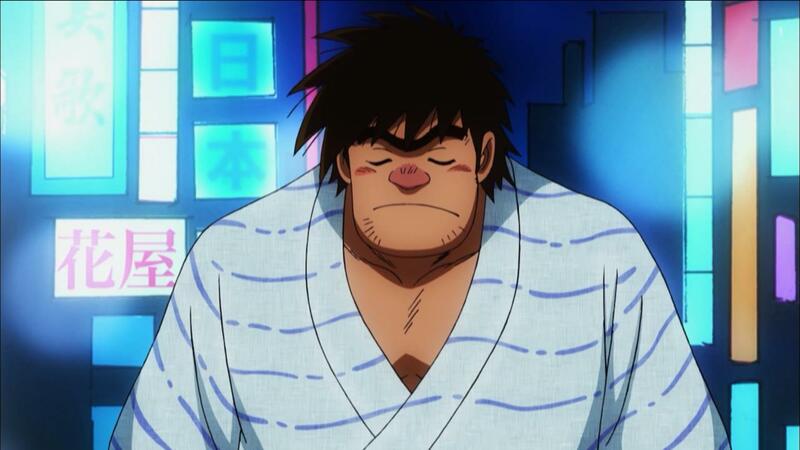 Matsutaro, meanwhile, is of the emotional disposition that he has nothing left than sumo anyway. 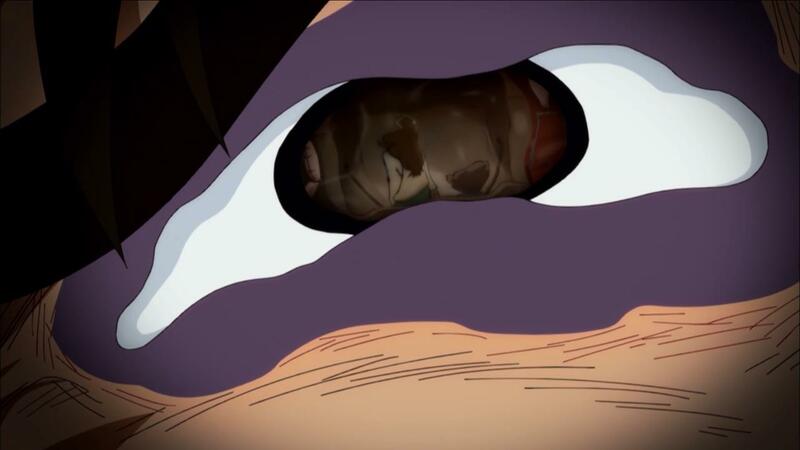 So this whole episode is certainly on the more serious end of the spectrum the series has rolled out when it has seen fit to do so, and we even get to see the family of our leading guy plan to come to visit him and watch on what will be this rematch bout. For the encounter it wants to be building up to (complete with Matsutaro reflecting on his lost love under the moonlight and then encountering a group of masked figures whose intent we do not know), it all does seem narratively appropriate, and as generally well executed for this series as anyone could ever ask for given its style. It also seems not quite right either though, like skipping over a chunk of chapters in a book. One can see perhaps that the later scenes do make sense, but without some additional connective tissues I feel I am supposed to be more invested than I actually am for this character showdown. If there had been more time, something like seeing more of Kondo here and here over time studying Matsutaro’s moves and physical game would have set him up far better as a potential final boss with a personal axe to grind with the man who injured him. As it is, this seems more like he was fished up to end the show than anything else. I’m sure Matsutaro will win the day, of course, but this does all seem to have come up in a hurry. 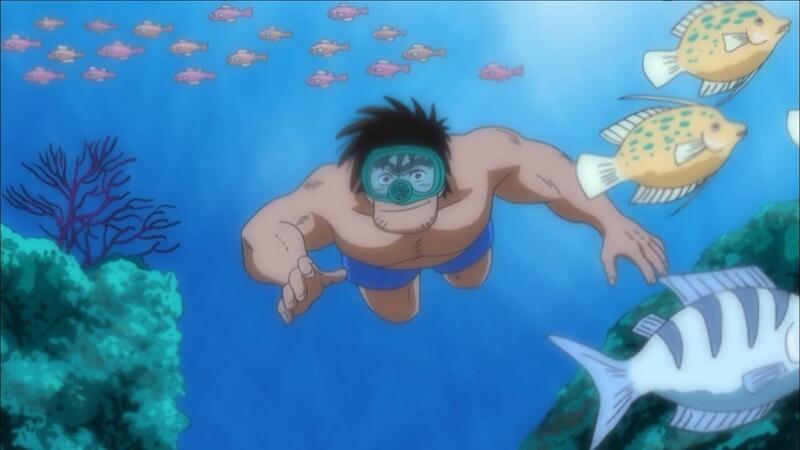 While some folks could easily go back and forth over the visual style of the series, trying to evoke 1970’s animation techniques as it is, one can not deny the show has the animation and storyboarding resources poured in for more “important” episodes. Matsutaro returning home, that sort of thing. For a season finale then, this is by far the best looking and most technically complex episodes of the series, which is nice to see having been planned out for. The camera work is more dynamic to follow character actions without cuts, there are more layers of shading, special shots for things like watching characters act through the eyes of another. It is a treat, and regardless of if the show was ended ahead of any kind of potentially longer floating schedule those who stuck with it and were enjoying their time are rewarded with a proper conclusion than something more slapped together. As the intended audience of this series likely skews a lot older, it is a pleasant piece of customer service rather than throwing them under the metaphorical bus. It means someone is more likely to watch the next time a revival project such as this comes along, or perhaps to indeed look into the source material more due to leaving with a more positive opinion. So, if it was not already clear, this was a solid episode to a series that caused a lot of people to drop it right away due to the rude and rowdy lead character. Most of our sumo stable have been sufficiently frustrated at Matsutaro to want to end his career, and so it was they who were shrouded in shadow at the end of our previous episode. The series remains some of its humor even now, through instances like our hero inquiring if his stablemates managed to time travel if they already know he will not be wrestling tomorrow. While Tanaka was able to talk down Matsutaro from jumping off a temple because of his unrequited feelings for Reiko via insulting him sufficiently, here he lays more on the love approach, and that his heart was also broken at the time and he needs to get out of here as soon as possible if he wants to have a career at all. And effectively, it does manage to work, which I appreciate. Matsutaro was at first confused, then prepped for a serious bout against multiple assailants, and now transitions to “I don’t even wanna fight anymore” mode. Which is all well and good, so long the the opponent does not throw a punch. And that this is precisely what they showed up to to, that is what goes down. So this brawl is not directly Matsutaro’s fault, in that he did not begin the hurling of blows here, though his series long aggravations coming to a boiling point amongst his teammates could be seen as one. And every last one of them, from Matsutaro and Tanaka one down, gets the daylights knocked out of each other. Which is not itself enough to keep Matsutaro from waking up at enough of a reasonable hour, drag himself to the championship bout, bandage himself up, and get to the ring for the Kondo game. It is a solid fight, going in and out of consciousness as he is and general missing of moves, as this is something he is forcing himself through via that sheer force of iron forged willpower that made him such a pain to others on different days. Reiko was even at the match to see him. Her mom even arranging for them to get to go together. And then they are sure to leave together in the middle of the match. So the message is clear: this is a much more prominent shutdown of Matsutaro than he received before, with more purpose and less opportunity for him to mope about it. Thus, he collapses. He loses the match, the championship, and a chance for promotion. He is laid up in the hospital with his compounded injuries. In conjunction with the prior street fight being blamed on him, he loses his career. Characters like our Raijin stablemaster and Ino-zeki discuss how his was nothing more than scum all along, and they were wrong to think they could ever change him. I mentioned last week Matsutaro’s family were supposed to visit to cheer him on for this match, and so indeed they too are here and put through having to deal with all of this. So in the end, we are back where we started, though perhaps a little older and wiser for it. Our conclusion is that our interview suited Matsutaro and Tanaka effectively head off together, looking for new opportunities elsewhere. A “bad ending,” for sure, insofar as our sport playing lead character failed to sufficiently climb the ranks and circumstances culminated in the loss of everything. No longer does he have that profession, and the girl of his dreams has shut him down twice. But, as a character progression, I feel this works out. He grew and yet regressed at various points, he had good times and bad. In the end it was his larger lack of concern for so many others over a long period of time that fostered an environment which allowed them the room to engineer his competitive downfall. Plus, I appreciate how Reiko not nudged along as Matsutaro’s love interest. She was never really interested in him that way from the start, and while it can be understandably troubling to know you have broken their heart when he confessed and was turned down, it is important to be assertive and ensure they get the message over acquiescing. I like how Reiko is not made into a more of a trite wishy washy prize here. I feel the series took a long time to find its groove, and as the topics a given episodes can swing from everything from fart jokes to serious business it runs a tonal gamut. I am under the impression the more older animation, and especially older animated sitcoms, one watches the better they will fair with this series. Especially if they are interested in how it tries to simulate 1970’s designs and animation methods. I would say it definitely improves over the course of the show, and by and large the second half of episodes are demonstrably stronger than the first. But the barrier to entry is quite high from the outset, as a lot of folks did not take well the obnoxious “would actually steal candy from a baby” lead character when this series premiered. That is an understandable reaction, and indeed the one most of the characters the show tend to have towards him over the course of it. In the end, I am of the disposition it turned out better than expected, especially for fishing around for a legacy manga property as old as this one. While he may no longer be in the league, I give Matsutaro positive marks, though it took him a while before he managed to shift my opinions out of a more neutral mode.